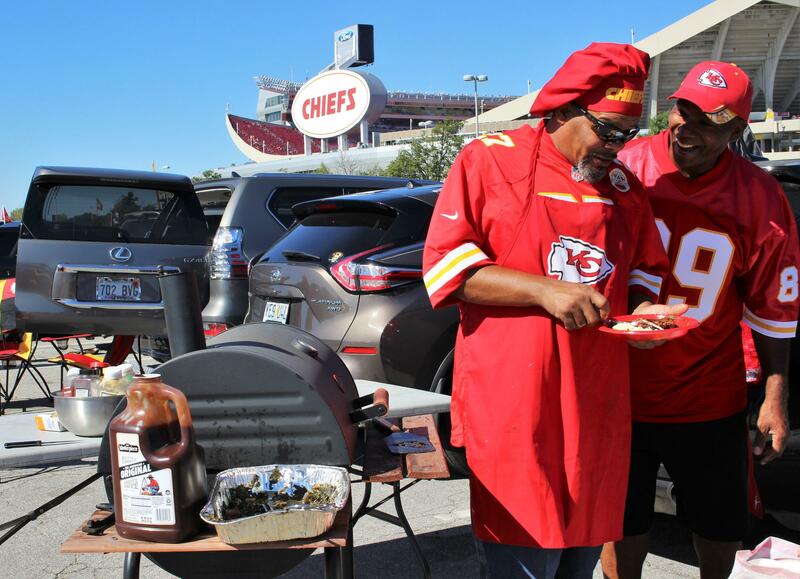 Tailgating was in full swing Sunday for the Kansas City Chiefs' first home game of the season. But a new rule may change some tailgating traditions. Greg Greenwell has season tickets and drives to Arrowhead Stadium from St. Louis for every game. He said he understands the new rule, but he's not happy about it, because it keeps family members who don't buy tickets from coming to tailgate with him. "I come over here, I spend the gas money, the hotel money, the restaurant money to come for a weekend, and now part of my family doesn't get to come," Greenwell said. Ray Daniel also makes quite a drive. He said he's come from Muskogee, Oklahoma, for just about every Chiefs home game for the past 33 years. He buys tickets, but occasionally, he'd stay behind to listen to the crowd from his tent and make sure the grease from his fish didn't catch fire. "I think it's rotten. They're going to lose money. That's $60 I pay to get in — they're going to miss that," Daniel said. Several fans brought up the 2013 incident when a fight between fans in the parking lot turned deadly. The Chiefs just settled that lawsuit this summer, and Chiefs President Mark Donovan acknowledged the incident did factor into the new policy. Phil Newton, who had a large flat-screen television from his bedroom set up in the back of his car, said the new rules are unfair. "A couple bad apples ruined it for the rest of us," Newton said. "When it comes to individual acts, I just don't feel like it should affect the whole. At the very least they should get more security around here to prevent that type of thing from happening, but don't punish everyone for it." Amber Morris and her friends packed up their Chiefs van and headed to the stadium 15 minutes before the noon kickoff against the San Francisco 49ers (the Chiefs won 38-27). Morris said she thinks the policy would be better if it was enforced at halftime or the third quarter. "It's a part of the atmosphere. That's what we're known for, is tailgating, all over the world. So why would you try to prevent people from that?" Morris said. Her husband, Kyle Morris, said he's worried it will lead to more drinking and driving, because a lot of the tailgating, and drinking, starts as early as 7 a.m. Hundreds of fans were still pouring into the stadium at kickoff, and a handful continued to drink and grill, like Justine Wiltz and Carlos Ramos from Emporia, Kansas, and friends of theirs who were in from San Francisco. They said they didn't know about the new policy. Ramos typically waits to buy cheaper tickets online after the game starts. "Usually we come and stay and at about halftime, we go in," Wiltz said. Parking attendants, security and police whizzed back and forth on golf carts right by their large tent and grill, but never stopped to enforce the rule. Nearby, an even larger group huddled under two tents watching the game on a large television in the back of a pickup truck, and dozens of small groups still wandered through the lots through much of the first quarter. Tasha Allen's tailgating crew was still in full swing at kickoff. Pointing around at the crowds still tailgating or slowly making their way in, she said she's skeptical they'll be able to enforce the rules. And, she said, more than the game itself, a lot of fans come for the sense of community. "It's about the Kansas City crowd, the Chiefs fans, everybody coming together," Allen said.